This place rates way up there as one of the most picturesque restaurants in Cardiff. Walk to the end of Mermaid Quay and there it is - sitting out in the bay on its own little pier. Book ahead to get a window seat and you'll enjoy some superb views across the bay as you wine and dine. As a result of its unique location this restaurant is a favourite with those looking to impress, whether it be a partner, boss or simply your folks! 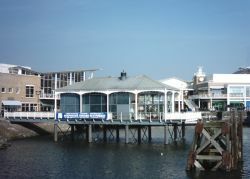 During the summer months you may choose to eat outside the restaurant as they have a small number of tables at the far end of the pier looking out towards Penarth Marina. The food is unusual too in that it's a Turkish restaurant. Now for anyone that thinks Turkish food starts and ends with Kebabs...think again! The starters here are delicious with some unique combinations I had not heard of. The main menu is quite varied and although most dishes were meat based I do recall a few vegetarian options. The staff are exceptionally friendly and will look after you well.